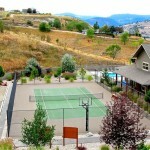 Welcome to our Okanagan blog from Seasons, Vernon, BC. The Seasons Club has added a new sport – Pickle Ball. The fastest growing sport in North America, it is wonderful exercise for people of all ages, and requires very little practice to become a reasonably good player. Members gather for fun games with a bit of competition. We have an enthusiastic mix of players, on three courts now available. More experienced players will coach newcomers so it is not important if you have ever played before, and rackets are available. Wonderful exercise, socializing, and sunshine. Join us.